One of the most highly requested items that we create is a fitted wardrobe design. This type of furniture can give you extra storage space while enhancing almost any room. Our company can create bespoke wardrobe solutions for you. We design, custom make and install fitted wardrobes in homes, retail locations and more. We can offer advice for the right option based off of the size of your clothing, the space you have and the style that you are interested in. We can source a variety of materials as well as install fixtures like panelled doors, unique skirting boards, antique handles and more. Alcove cupboards with shelves are very popular storage solution for London properties simply because of the chimney breast with fire place which normally located in the lounge. The chimney breast is creating two alcove space either side and these alcoves traditionally were a space for cabinets with set of shelves above. Alcoves cabinets and shelving can be done in few different way. A simple alcove cupboards with open floating shelves above are good solution for contemporary properties with flush walls and ceiling but can be also beautifully fit into the house with traditional details like cornices dido and picture rails. Some of our projects like on the image were success mix of the traditional alcove cabinet and modern floating shelves above. These style is very popular choice these days. Our alcove cupboards can be made in many different configuration most of them you can find in our Alcove Cupboards Gallery. Bespoke Cabinets can be made in traditional manner by adding some beadings and moulding on the doors, creating a lip and highlighting the countertop, adding skirting board along the bottom and creating V groove cut on the frame. 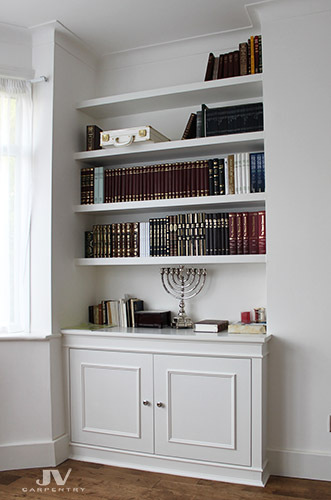 These traditional alcove cupboards can be made with bookcase at the top. Bookcase can be also made with some details such us v-grooves on the frame and cornice along the top to create traditional décor. To craft our contemporary alcove cupboards we are using clean and plain finish such a floating shelves or random cubby holes with flush and plain doors without handles and made with push-to-open mechanism for access inside the cupboards. We made a lot of variations of them in the past including simple plain or more complex traditional styles, some of them you can find in our work gallery. A large fitted bookcase within your home can give you plenty of storage space for your home as well as create an enhanced look for any room. Including cupboards of the bottom level as well as unique doors for hiding items away can build a beautiful art piece for your home. We can create traditional fitted bookcases with LED backlighting, Grooved framed accent pieces, beaded doors and more! This chunky shelving style with cube dividers can create a stark contrast for your wall that resembles an art piece. The process of creating this type of fitted bookcase with cupboard doors can improve your storage space while giving you a fresh new look for your home. We fix the MDF section directly to your wall without backboards and hide everything into the shelves to create a stunning and colourful floating look. The Floating shelves are strong even though they have no visible supports all the brackets are hidden inside the structure. They appear to float on the wall and you won’t see a clunky hardware or brackets holding the floating shelf. If compare a floating shelves and shelves with the frame, floating shelves create an open look where you still can see the walls on the sides and this create a feeling that the shelves cutting directly into the walls. The standard thickness of our floating shelf is 43mm and we can make a thicker shelves if required. Our floating shelves are completely solid inside with zero chance to be bow in the future and great solution to store your heavy items and books. Our floating shelves can be linked between each other creating a cubby holes deterrent sizes – very popular choice in modern properties. Often people need a working space at home with fitted cupboard, desk and lots of shelves. The cupboards give you a space to hide a lot of items behind the doors, a desk provide you with the working space and place for your PC or laptop and shelves give you a space for all your files and books. Of cause we can always to add some drawers for easy access to important items. The radiators can look awful and some people prefer to cover them with nice piece of furniture. We make them in few different styles either contemporary or traditional Victorian with some of details like beadings, grooves and skirting boards. You can find some of examples in our gallery. Our staff can install custom-made TV cabinets which can be used to store and hide away all of your TV equipment such as gaming systems, satellite boxes, DVD players and more. We can create fitted TV cupboards with unique grille doors to ensure your remotes can continue working with the cabinets closed as well as units which are large enough to hold up your Television, home theatre system elements and more. The boilers and meter fuse boxes are not pretty and it’s good idea to close them inside the cupboard to hide all the pipe, taps and electrical wires inside. We also can create some shelving storage space above or below the boiler even if you have a lot of pipes on the way we can cut all shelves around them and make some extra storage space for you. A simple solution normally inside a fitted wardrobe to create an easy access for all your shoes. They work the same way as the drawers, it’s a pull out shelf with the lip at the front to pull the shelf out and at the back to stop shoes falling off. Our custom chest of drawers can be used to store all of your clothing, wardrobe items, accessories, shoes and more. A chest of drawers is a wardrobe that has extra storage space and different size drawers for all of your storage needs. We produce our custom chest of drawers out of standard 18 mm MDF or other materials on request. We also include only heavy-duty double extension draw runners for maximum lifespan in every drawer construction we complete. We can craft bespoke walk-in wardrobes without the need for a doors in the front. These wardrobes made normally in a small room where the wardrobe doors might be an issue due to available space. 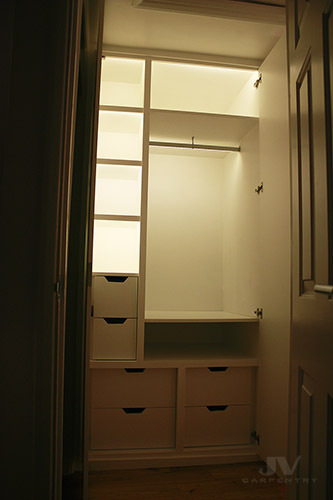 Our walk-in-wardrobes can be made with drawers and LED light is also good addition. Walk-in-wardrobe can be fitted into almost any small room or a corridor to provide an extra storage space for clothing, accessories, outdoor items and more. If you have for example a tiny bedroom and you wish to convert it in to walk-in wardrobe space these wardrobes obvious need to be bespoke made to fit the size of the room. We can help you to provide you with design for your walk-in wardrobes to agree all the details prior installation process. The walk-in-wardrobes can be made with large or small drawers, where two separate small drawers can store your underwear and another one can store you socks to keep your clothes well organised. Large drawers can be handy for keeping your shoes or pair of jeans. Our walk-in-wardrobes can be made with LED hanging rail to provide more light inside the wardrobe and you can easy to find your clothes in the dark. The shelves inside your walk-in-wardrobe can also be made with LED strip light running under the lip at the front This way the light inside the wardrobe wont be pointing your eyes and will be opposite direction towards the clothes. This low voltage light is very safe and almost not creating any heat. It is good additional to your walk-in-wardrobe interior design and can simply make your life a little brighter. We can craft a high standard of fitted bedroom furniture including wardrobes, cupboards, bedside tables and shelves in the bedrooms. Bedroom furniture is one of the biggest aspects in our industry and we created a lot of furniture for our client’s bedrooms around the London. Either you required a fitted wardrobe or chest of drawers to build in your bedroom we can help you to design your furniture in the perfect way. Fitted wardrobes are the main part of the bedroom furniture and each bedroom project is unique and made to the bespoke specification of each our client. Our designers team will help you to chose your perfect location for your fitted furniture in your bedroom and give you an advise on how to design your wardrobe interior in the best way to maximize the space inside. Wall-to wall fitted wardrobe can add a beautiful décor to your bedroom as well as adding a lot of storage space to store your clothes. The wardrobe doors can be painted to match the colour of your bedroom walls and this can create a striking fitted furniture piece. A fitted chest of drawers is also a good addition to your bedroom furniture. It can add a lot of separate storage compartments to separate your clothes with easy access and create a valuable storage space for clothes in your bedroom. Made-to-measure bedside tables either side of your bed are also very handy to have in your bedroom. You can simply put a cup of tea or alarm clock on top of the cupboards. We know very well how important a storage space in the small bedroom and our bespoke bedroom furniture can help you to use every inch of it. Just think about two fitted wardrobe either side of the bed in the corners of the bedroom and potential space over the bed. A nice row of fitted cupboards can run across the ceiling linking two fitted wardrobes together with clean line of doors along the top. These create in your bedroom a plenty of extra storage space to place your boxes, suitcases and bedding into over the head storage. Few floating shelves or fitted bookcases can be also a great additional to your bedroom furniture. They will give you some open shelving space to display your ornaments, favourite books or lamps. Some of our bedroom wardrobes can be made with small corner shelves on the side for storage and display purposes. Walk-in-wardrobe is another great fitted bedroom furniture piece. If you have a small bedroom which you might want to convert it into walk-in-wardrobe to create lots of storage space for your clothes this can be a great solution for you. If you have a bay window, one of the most striking pieces of furniture that you can install is a seat for the window. It can be very difficult to make use of the space within a bay window differently. With our made-to-measure Custom bay window seats, we can help you get access to extra seating space within your home as well as extra storage space underneath the seat itself.